Pause……….and breathe out slowly…………… what a fantastic idea. Following on from last week’s post about Vogon Planners at the local council, I’ve had a brush with petty laws and useless officials (an unjustifed parking ticket) so this feels very relevant. 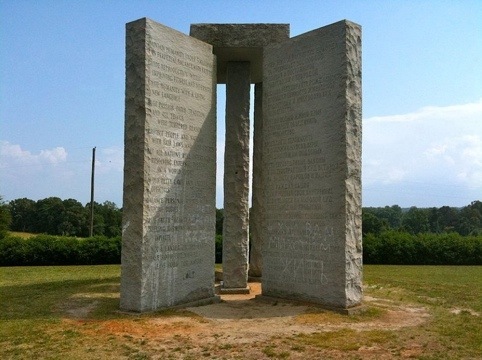 “Avoid petty laws and useless officials” is the seventh of ten principles which are inscribed on the Georgia Guidestones which are located in Elbert County, about 90 miles from Atlanta. They have been described as the American Stonehenge (by someone who’s possibly never been to the proper Stonehenge or Avebury) and are a fairly controversial structure. The stones are astronomically aligned (uh ho…… something going on here…..?). I’m not going to list the ten principles, have a look at the illuminating Georgia Guidestones entry on Wikipedia. The interesting stuff is who built them? Nobody really knows. If you fancy digging into a bit of conspiracy theory around them; have a read of Brian Dunning’s skeptoid blog. with few “petty laws and useless officials”, at organisational level, let alone worldwide. York Times shows how students have thwarted the bans on Facebook in schools. I blogged about this topic a while back in stop the social media arms race in schools. However (in my dreams), if organisations trusted people a little bit more, this would help to create an environment where people are engaged and start to show commitment to the organisation. Surely an organisation where people are engaged and committed has got to be better than one where they are compliant with the rules (just about). We could all do with fewer, petty laws and useless officials. Trusting people to do the right is fundamental to achieving this situation. Trying this with the use of social media in organisations could be a good test and a way of building up trust.